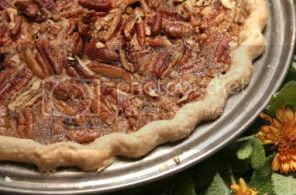 Another recipe that I make this time of year, usually for Thanksgiving and Christmas, but being how pecans are native to Texas, we really have been known to still serve this at functions like potlucks, BBQ's, and to crush some up in ice cream for a nice summer treat. This is one of my most favorites desserts, and one that I include in my food intake during special occasions! Mix corn syrup, eggs, sugar, butter and vanilla using a spoon. Stir in pecans. Pour filling into pie crust.Bake on center rack of oven for 60 to 70 minutes (see tips for doneness, below). Cool for 2 hours on wire rack before serving. **If you use prepared frozen pie crust: Place cookie sheet in oven and preheat oven as directed. Pour filling into frozen crust and bake on preheated cookie sheet. This will ensure that the pie crust bottom will cook evenly with the rest of the pie. We like this served chilld, or warm. But please cool for at least an hour and a half to ensure that the filling cools down enough to set up. This is amazing with a scoop of vanilla ice cream, topped with whipped cream, or just as it is!